Back to the roots today with a visit to Stonehaven – scene of one of the two iconic paintings from the history of the Scottish Episcopal Church. 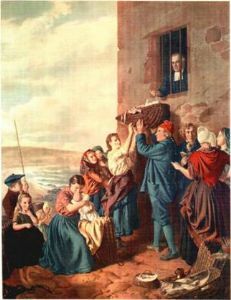 This one dates from 1748 and shows Rev John Troup baptising a baby through the bars of Stonehaven Gaol. You can read the full account on the website of our congregation in Stirling Following the failure of the Jacobite Rising, the Episcopal Church lived under penal laws which prohibited worship with more than four people present. My visit was for the Preliminary Meeting of the Electoral Synod for the election of a new Bishop of Brechin. I did my geek’s guide to Canon 4 which governs the electoral process. And we explored our shared vision of the future. Given the very prescriptive nature of Canon 4, we know that the process will end on April 2nd. I suppose what is interesting to consider is the extent to which that picture still shapes us today. Many of course have little knowledge of our deep roots in Scottish history – or of our history of persecution – or of the doggedness in our nature which comes from that. Anyway the satnav took the faithful Passat to Stonehaven and back on a very wet day. You’ll be glad to know that the rear footwell is now driza-bone since they cleared the drains under the battery. That cunning little hole which they drilled in the floor may also have had something to do with it. Waitaminnit: wasn’t the Jacobite Rising a *Roman Catholic* plot? Why would the SEC be punished for it? Interesting question about how much the picture shapes the SEC today. For me personally, the fact that my ancestors were Episcopalian fishing folk from Muchalls, and were part of the whole Stonehaven tolbooth scenario, has made me very conscious of the SEC’s heritage, independence and distinctiveness. The impact of this is that whilst an admirer of the Church of England in its context, on home turf I don’t feel any affinity with it, and always bristle when someone refers to the SEC as “the English church” or the CoE! For a while now I’ve mused over the idea that the SEC is an “estranged wing” of the Church of Scotland. Easy to get touchy and nationalistic about this subject, I guess! That’s interesting, Martin. One of the things which I carry from Ireland is a deep suspicion of any attempt to claim purity of identity. Most of us – and most of the institutions which help to shape our identity – are mongrel and the SEC is no different. All the more need to tease out the various strands. I like this approach, Bishop David, and totally agree that the SEC is full of different strands. A few years ago, whilst researching an essay for my BD, I found it impossible to nail down the SEC in terms of its ‘doctrine of the church’ as a whole due to these many different historical strands. The strange thing is, that this still leaves me with my own experience and context – and I feel that that is less about being “purist” in terms of identity and more about authenticity.